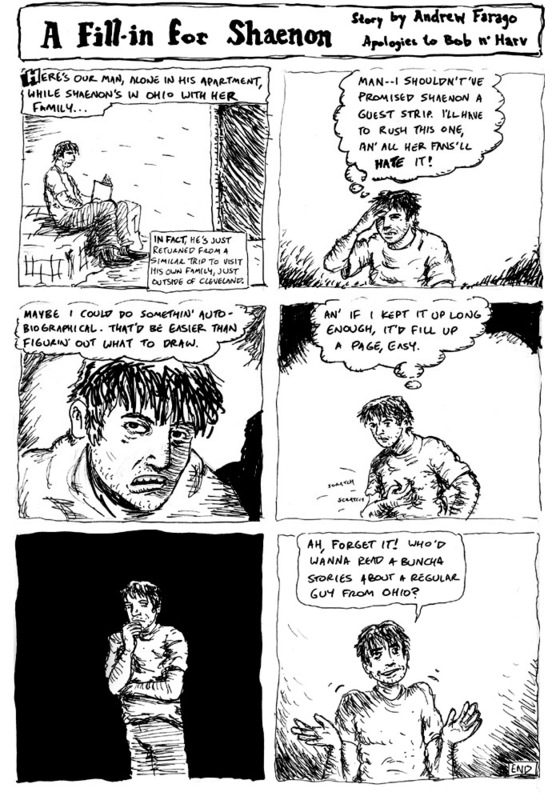 Guest artist Andrew Farago is channeling the spirit of Harvey Pekar, creator of the autobiographical comic American Splendor. Andrew recently curated a show at the Cartoon Art Museum devoted to Pekar’s work, which you can read about here. He got interviewed about it for this article on the new “American Splendor” movie. The article says he’s the director of the museum. He’s not really. Present-Day Shaenon here. I don’t have much to day about this one because Past Shaenon already said it above. This was one of the many times I ran out of material for Sunday features and made Andrew draw something for me. He did a pretty nice Crumb/Pekar pastiche. The link to the Cartoon Art Museum exhibition no longer works, but the link to the article does, surprisingly enough. Hats off to Andrew! He’s got R. Crumb’s style down perfectly. Well, I’ll just ramble about my life! Andrew, you can draw Pekar! Channeling a Crumb named R.! That art style makes me keep waiting for the werewolf tranformation. I recently noticed that Andrew was apparently involved in organizing a “Watchmen” exhibit at New York’s Museum of Comic and Cartoon Art. Though he was unfortunately credited as “Andrew Fargo”.